Topic Index for "WordPress Premium Plugins"
Learn how to use WordPress Plugins to get the most out of your WordPress. Here we feature popular and handy premium WordPress plugins that will enhance the experience of the dashboard, user experience and help viewers of your website to get the most out of your content. You’ve created your WordPress website, you’ve added your content and maybe you’ve even hired writers and started being a multi-author website. The very next thing you should be considering is a backup solution to protect your website. I’m never one to fully rely on my web host to backup my stuff. I’ve read the nightmares some people have had when a web host had a hardware failure with RAID configuration corruption that wiped out not only client websites but the backups to that data too. Way too risky. Let me help you take control of your website backups with various solutions that I recommend and use on my websites along with client websites as well. Let’s start with the obvious. There are ways to backup your WordPress without using any automation at all. No WordPress plugins, no monthly paid services and it’s fairly straight-froward and easy to accomplish. The problem? The manual backup is… well.. manual. You will have to remember to use your chosen method at least on a weekly basis to grab your backups and store it on your computer. Other than that, if this sounds like a great solution for you, Mr./Mrs. I’m in CONTROL and that’s the way I LIKE IT, let’s get started! Consider a USB external drive. Using an external hard drive will help prevent your backups from clogging your main hard drive over the long term. Also consider using a naming structure where you download your backups to a dated folder, something like 20150529 for May 29th, 2015. I put the year first so that Windows (or Mac) will automatically sort the folders by year then date. Most people are on a cPanel based web host. Examples of popular web hosts that use cPanel are InMotion Hosting, HostGator and SiteGround. If you see a section that looks similar to the screenshot above, then continue on! Login to your cPanel using the instructions provided by your web host, find the Files section then click on Backups. From here, you have three options. Download a Full Website Backup – This will generate a full backup zip file that will include all files on your entire cPanel account including your email on server, cPanel configuration settings and yes, your entire website data including images and your database(s). Download a Home Directory Backup – This will generate a zip file of all of your website files but it will not include your WordPress database. Download a MySQL Database Backup – Clicking on a database here will generate a zip file of your database to download. I prefer to download the home directory and MySQL files separately so that I can restore them easier if needed. That choice is up to you. If you happen to be on a Virtual Private Server, you will have access to a much more powerful backup solution. 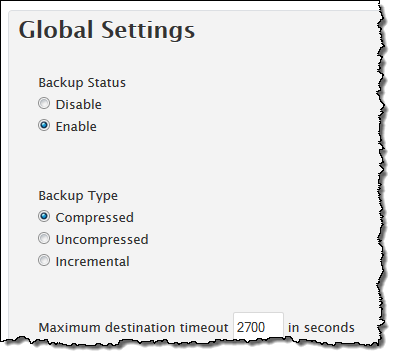 Login to your WHM, search for backup and click on Backup Configuration. This will bring you to the screen shown on the right. Here’s the backup settings I’d recommend for you to use but feel free to play with it. Once you save your configuration, you are set. Now all of your cPanel accounts will be backed up and you’ll likely get an email from your server letting you know a backup has been completed every Sunday. Just login to your server with FTP, navigate to the /backup folder and begin your downloads. You should be able to find a backup option on any web host you are on. For instance, in Parallels Plesk Panel, find the Backup Manager under the Files section. The process is very similar to the cPanel method shown above. If you have a vDeck control panel such as the one provided by iPage, then look for Archive Manager and zip the entire www directory. Based on my experience with some less-than-optimal web hosts, you may need to download your WordPress database the old caveman way using PHPMyAdmin. Every host I’ve encountered has had access to PHPMyAdmin because it’s the easiest way to allow clients to make changes to their database. 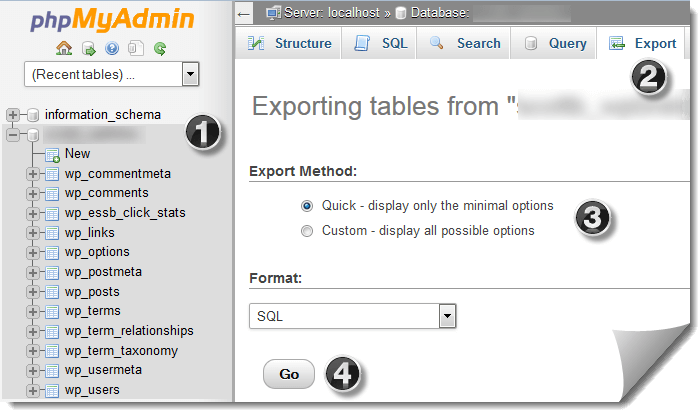 Fortunately, PHPMyAdmin also allows you to download your entire database. Click the database name on the left, most likely, you only have one database to choose from (for security reasons, we blurred our database name). Keep Quick as the radio button selected. Click Go. You will instantly receive a download prompt to download your entire database. Take that you data hoarding web host! 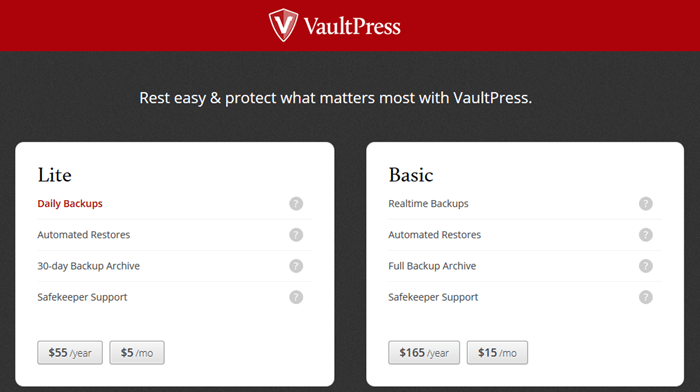 VaultPress is a premium service provided by the Automattic team, the same guys who develop and run WordPress.com. Services start at $5/mo and it includes full daily backups with automated restores should you need to. It also includes a 30-day backup archive and customer support if needed. You can upgrade to the Basic plan which does real time backups and will allow you to keep a full backup archive so that you could restore from a 90-day old backup if you needed to. Download VaultPress or go to Plugins > Add New, search for VaultPress and install the one with author Automattic. After installing VaultPress, you will be asked for a subscription or your registration key if you have one already. There is no free version available. WP Engine is a web host that specializes specifically with WordPress. One of the coolest features that these guys offer as part of the service is automated backups of your data and database in a method they call Backup Points. WP Engine will save a full month of your backups that you can restore from. Just click the checkbox next to a backup point, click the restore button and follow the instructions. It just doesn’t get any simpler than that. Additionally, you can create your own new backup and download that to your hard drive whenever you want. To download your backup, place a check in the archive you want to download and then click Download Zip. From there, WP Engine will send you an email with the download link to download your archive. I recommend doing this once a week just to be safe. There are a couple backup plugins that you can choose from. These are both easy to use and easy to configure and will allow you to backup your website from within your WordPress dashboard. BackUpWordPress – This plugin works great in shared hosting environements and offers all of the features you’d expect including scheduling, direct downloads and more. It will backup your entire website including files and database. This plugin doesn’t include functionality to backup your files to an external server. BackWPup Free – This plugin will also backup your database and your /wp-content/ folder (where all the most important WordPress files that you upload are located). The one benefit this plugin has it it works with Dropbox, Amazon S3, Microsoft Azure, RackspaceCloud, SugarSync and has support for FTP transfers. The problem with these plugins is they can be resource intensive depending on how large your website is. At some point, you might get an email from your web host telling you that your website is using too many resources and it will likely be from a backup plugin or from a caching plugin, so keep that in mind. Another issue you may have is forgetting to download your backups. All these plugins do is help you create your backups but they do you little to no good if your host suddenly goes offline, has a catastrophic hardware failure or something similar that wipes your site off the Internet. It’s always good to have a local copy. If you choose to go this route, make it habit to download your backups on a weekly basis and consider setting up a weekly alert on your phone with Google Calendar. Story Time: I had a client that had a similar plugin installed. They configured it and let it do its thing for years. There was well over 50GB of backup files that his web host was complaining about that he had no idea were there. Within 1 hour, I took his site from 50GB+ to 400MB which completely satisfied his host. My point? Download your backups and delete them from your server on a regular basis. Find it at Tools > Export. There are times that you may need to export a file of just your post content for importing into another WordPress website. I had to do this for a client that wanted to migrate from a WordPress MultiSite install to a regular WordPress install. Using this method will create an XML file that will contain all of your posts, pages and custom post types content when you select the All content option. The problem with using this method is a big one. If your website goes offline and you try to restore from this XML file, WordPress will not be able to access your media embedded within your posts. Therefore, all of your content that has images will show broken images everywhere. I don’t recommend using this method unless you have a unique situation like we had. Backing up your entire database and full website structure is way cleaner to restore from and it doesn’t rely on your current host being online to work. If you are migrating web hosts, it’s a simple as logging in to your domain registrar and changing the nameservers to your new host. 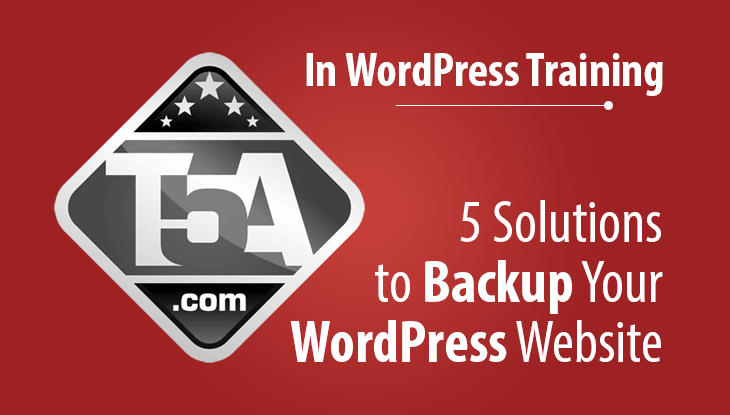 What’s your favorite way to backup your WordPress website? Chime in at the comment section below. As always, if you feel this guide will help someone, please pass it on to them and share it on social media. I appreciate your support!